Native Americans and progressives are fuming at Sen. Elizabeth Warren (D., Mass.) over releasing a DNA test showing she could have distant Cherokee ancestry, with many arguing she had done harm to indigenous peoples by blurring the lines around Native identity. Warren has long been dogged by controversy over listing herself as Native American while teaching law school in the 1980s and 1990s; Harvard and the University of Pennsylvania listed her as a minority faculty member. She even contributed to a Native American cookbook called "Pow Wow Chow." President Donald Trump mockingly called her "Pocahontas." Warren finally released a campaign-style video Monday featuring analysis of her DNA test, interviews with family and former colleagues, and her own narration of her life. She triumphantly tweeted Trump owed her $1 million regarding an offer he made about a hypothetical debate where she could prove she's an Indian. The results drew mockery: At best, she was 1/64th Native American and possibly as little as 1/1,024th, with an ancestor as far as 10 generations back. It also drew anger from some Democrats, who didn't want to be talking about her DNA with the midterms three weeks away. Now, she's getting significant blowback from Native American groups who say she has done damage to indigenous people and helped perpetuate myths about what constitutes Native American identity. Cherokee Nation Secretary of State Chuck Hoskin Jr. blasted Warren the day of her DNA revelation, saying such tests are "useless to determine tribal citizenship" and accusing Warren of "undermining tribal interests with her continued claims of tribal heritage." "Current DNA tests do not even distinguish whether a person’s ancestors were indigenous to North or South America," he said. "Sovereign tribal nations set their own legal requirements for citizenship, and while DNA tests can be used to determine lineage, such as paternity to an individual, it is not evidence for tribal affiliation. Using a DNA test to lay claim to any connection to the Cherokee Nation or any tribal nation, even vaguely, is inappropriate and wrong. "It makes a mockery out of DNA tests and its legitimate uses while also dishonoring legitimate tribal governments and their citizens, whose ancestors are well documented and whose heritage is proven. Senator Warren is undermining tribal interests with her continued claims of tribal heritage." A descendant of Pocahontas told Fox News that Warren should apologize for using Native heritage for political gain. "It did prove that she wasn't the Cherokee Indian that she was claiming to be for so long," Debbie White Dove Porreco said. "I think she's guilty of claiming she's an American Indian but has no proof—and then [is] using it for applications for college and for political reasons." Navajo Nation member and geneticist Krystal Tsosie wrote in The Atlantic that Warren was "not Native American," and "her public gambit could dangerously obscure that distinction" between that and having ties to indigenous peoples. Kelly Hayes and Jacqueline Keeler wrote an opinion piece for NBC News that Warren's gesture was meant to push back at Trump but unwittingly hurt Native American people through the framing of her as possibly 1/64th to 1/1,024th Cherokee. "Warren stated that she is not a member of any tribe, but her efforts to connect DNA and Native American heritage could nevertheless have unintended consequences," they wrote. "It is a common joke amongst Native people that the phrase ‘I’m 1/16th Cherokee' (or in Warren’s case, 1/64th to 1/1024th Cherokee — the DNA test can only offer up a possible range) is a ‘white proverb.' While the framing of Native identity that has emerged in discussions of Warren’s background is incredibly common, it is also highly destructive to Native people." Hayes and Keeler argued Native peoples are "characterized as a generalized population with stereotypical characteristics," with significant legal consequences regarding ownership of land and tribal identity. "Most Americans are unacquainted with the true legal nature of Native identity; Warren's DNA test will doubtless muddy the waters considerably, dealing Native nations a real political blow," they wrote. Cherokee Nation citizen Brandon Scott, an Oklahoma resident, penned a Vox piece about being "fed up with people like Elizabeth Warren claiming Native heritage." "Warren made her DNA claims to stop the name-calling," Scott wrote. "But she, in my opinion, has propped up a growing sect of people who think they can rely solely on a DNA test to confirm their identities. A DNA test will not explain the struggle or plight your ancestors had to go though to make it to a rough patch of dusty earth in exchange for their ancestral homelands." He said he bore no ill will toward Warren, contrasting her with people who perniciously pursue fake Native American identities, but added her actions legitimized "the myth that Native American heritage is tied to DNA." For her part, Warren tweeted "DNA & family history has nothing to do with tribal affiliation or citizenship, which is determined only – only – by Tribal Nations." She said she was merely corroborating her own family lore. Cherokee Nation member Julie Reed wrote for New York Daily News that she could not support Warren after the stunt, in spite of agreeing with her politically. "Let’s be clear on what Warren hasn’t demonstrated she completely understands: Being Native American is a political and cultural affiliation determined by Native peoples, not a quantifiable racial classification," she wrote. "This isn’t the first time otherwise educated people, including policymakers, put their faith in science in ways that undermined tribal sovereignty. Scholars of Native American histories, and especially of southern tribes including the Cherokee, know all too well the damage wrought by "blood quantum," fractions of Indianness based on ancestry." Reed warned that others could make similar claims to Cherokee ancestry and render tribal sovereignty "meaningless." "Warren is a powerful U.S. senator with a public platform who has just validated a wrong-headed definition of ‘Native American.' What is less clear to many of us in Indian Country is what these political maneuvers related to her identity actually mean for the advocacy and protection of tribal sovereignty and vulnerable Native peoples," she wrote. Mainstream and liberal columnists also panned Warren over the move. New Yorker staff writer Masha Gessen said Warren had reinforced "one of the most insidious ways in which Americans talk about race: as though it were a measurable biological category, one that, in some cases, can be determined by a single drop of blood." "Genetic-test evidence is circular: if everyone who claims to be X has a particular genetic marker, then everyone with the marker is likely to be X. This would be flawed reasoning in any area, but what makes it bad science is that it reinforces the belief in the existence of X—in this case, race as a biological category. Warren’s video will hardly convince a Trump voter, who will see only a woman who feels that she has to prove something. Trump himself has already walked back his promise of a million-dollar charity donation. Warren, meanwhile, has allowed herself to be dragged into a conversation based on an outdated, harmful concept of racial blood—one that promotes the pernicious idea of biological differences among people—and she has pulled her supporters right along with her," Gessen wrote. Liberal Washington Post columnist Dana Milbank wrote Warren had shown herself "unfit to lead" and castigated her for taking Trump's bait. 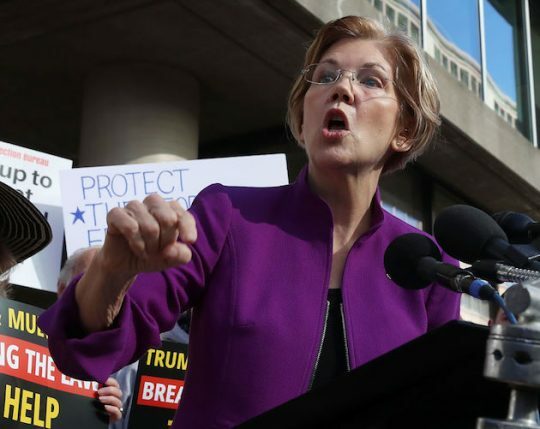 "This is why Warren’s DNA stunt was such a blunder: She took Trump’s DNA-test dare and let him divide us — again — by race and ethnicity, just as he did when he goaded President Barack Obama to prove his legitimacy by producing his birth certificate," he wrote. CNN's Chris Cillizza wrote Warren might have made matters worse for herself as she sought to rid a future campaign of this controversy. "What Warren was trying to do with this video and DNA test then is show fellow Democrats that she was ready to fight back and had the firepower to rebut any attacks by Trump. A good idea — in theory! But, in practice, things are working out less well. Because Warren is not able to provide an answer on her Native American background that seems to totally and completely pass the smell test," he wrote. This entry was posted in Politics and tagged Donald Trump, Elizabeth Warren, Media. Bookmark the permalink.